The MS International 12 in. x 12 in. 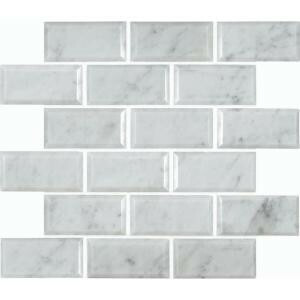 Greecian White Polished Marble Mesh-Mounted Mosaic Wall Tile has a soft white color with gray veining and a smooth, polished finish. The 2 in. x 4 in. brick pieces are fashioned with beveled edges to add definition to any residential or commercial expanse, certain to infuse your space with visual allure. Boasting random tone variations for extra character, they look particularly stunning as kitchen backsplash or tub/shower surround, and also perform splendidly as an accent panel or countertop surface. Note: Inspect all tiles before installation. Natural stone products inherently lack uniformity and are subject to variation in color, shade, finish, etc. It is recommended to blend tiles from different boxes when installing. Natural stones may be characterized by dry seams and pits that are often filled. The filling can work its way out and it may be necessary to refill these voids as part of a normal maintenance procedure. All natural stone products should be sealed with a penetrating sealer. After installation, vendor disclaims any liabilities. 1 square foot per piece, each piece sold individually. Piece weight is 4.5 lbs. Buy online MS International Greecian White 12 in. x 12 in. Polished Beveled Marble Mesh-Mounted Mosaic Floor and Wall Tile GRE-2X4PB, leave review and share Your friends.